I tested this DiCAPac Alpha waterproof camera case using my Casio Exlim point and shoot camera underwater in the Pacific Ocean, on the beach around sea lions kicking up sand, and river rafting near Telluride, Colorado. Each time, the DiCAPac case kept my camera completely protected from moisture and permitted me to continue taking photos that might otherwise may have been missed. Even better, It also comes with at a very affordable price tag, and DiCaPac offers models for smartphones, which makes it a must have for many travelers. I was a little nervous about putting a reasonably expensive camera in the water using this DiCAPac Alpha waterproof camera case for the first time. I was somewhat reassured after following the recommended testing procedure, which instructed me to place some tissues in the pouch, sealing the case, and submerging it in a bathtub prior to using it with a camera. It was only after the tissues came out completely dry that I was finally convinced that the case was fully waterproof as advertised. I first put the case to the test while whitewater rafting near Telluride, Colorado. We were constantly doused by big waves throughout the ride, but the pouch protected the camera, keeping it dry at all times. I did have to wipe down the plastic covering the lens on a few occasions, as the case did not repel the water drops as well as I had hoped. That resulted in photos taken with a wet lens showing blurry sections that I was forced to crop out using Photoshop. The very first time I took the waterproof case on a beach I promptly dropped it – and the camera inside – into the sand. No problem. I simply rinsed it off in the ocean, and went about my day without any sand managing to find its way inside the delicate camera mechanism. Perhaps the best use of the case however was while snorkeling. The entire pouch and camera can be completely submerged under the water, truly opening up the opportunities to take some outstanding photos. I was still able to use the camera's zoom and flash features, but chose to leave most of the settings on fully automatic. The results were surprisingly good. The best photos were taken when I dove under the surface and got eye-level with the fish, turtles and sea lions. As with any underwater digital photos, I found it necessary to use Photoshop to increase saturation and contrast for the best pictures, but that is natural for the setting and not reflective on the performance of the case in any way. I also used the cloning stamp to get rid of the back splash (light reflections of particles in the water), which sometimes make their way into the final shots, but again this was due more to the setting and not the case itself, which continued to do its job just fine. 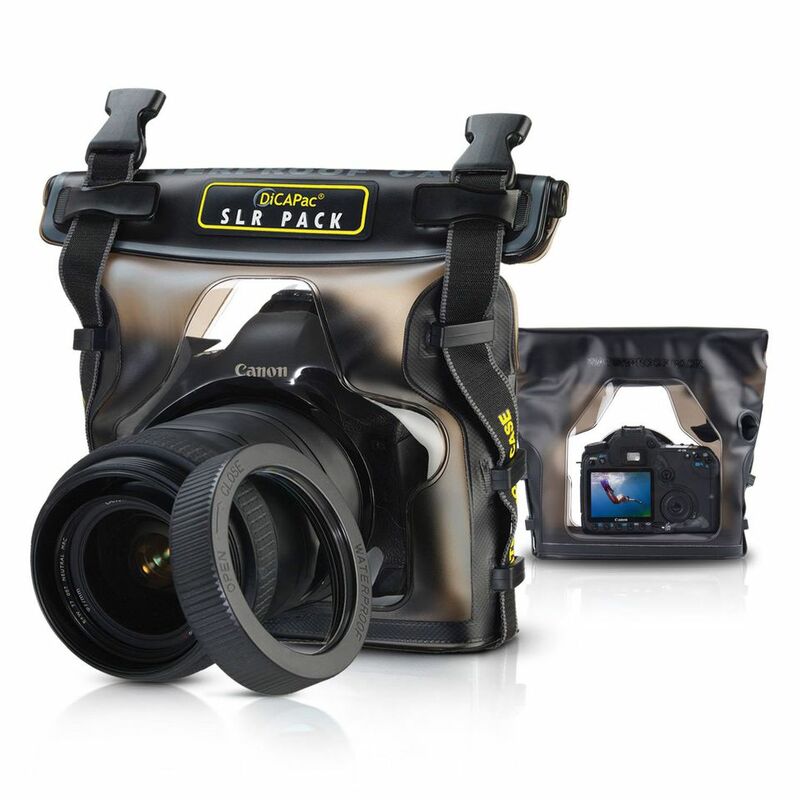 DiCAPac makes several other protective cases that can be used for inner-zoom point and shoot cameras, and for high-end digital cameras, plus smartphones too. They also make products that help keep the contents of your wallet dry as well. On the company's website, there is a chart that outlines which waterproof camera cases go with specific cameras, making it easier to select the one that best fits your needs. All of the are priced affordably, with cases starting as low as $19.99 depending on your needs. The one I tested costs $39.95, but the higher end models will set you back as much as $100. To checkout all of the options available visit dicapacusa.com.